Here’s another confusing scenario at Martin’s Country Market in Ephrata, Pennsylvania. 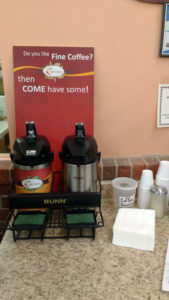 In the store, by the bakery, Martin’s offers free gourmet coffee, both regular and decaf. It’s very good. Between the urns and coffee machine is a plastic container for, “Coffee Donations.” Now, technically “free” is not on the sign behind the urns. But, nevertheless, you’re invited to have some. Is the donation cup there so Martin’s can recoup losses from giving away free coffee? Possibly “donation” implies that Martin’s Country Market is a charitable organization when, in fact, they are a for profit grocery retailer. Maybe it is something of an ethical dilemma for the Mennonite-owned establishment. In good conscience, they cannot give away something for nothing. That would be wrong. Me, I’m not giving them a dime.